Recruit and train your board members to embrace fundraising. Did you know that 30% of development professionals who were planning to resign cited problems with their boards as the key reason for their departures? Use this guide to tackle this problem head-on. It features tips and tools you can use to establish, educate, and empower a board that fully embraces fundraising. Recruit, train, manage, and set up your board members for success. Give the right answer to the most common excuse for not helping with fundraising. Make the most of your time before, during, and after board meetings. 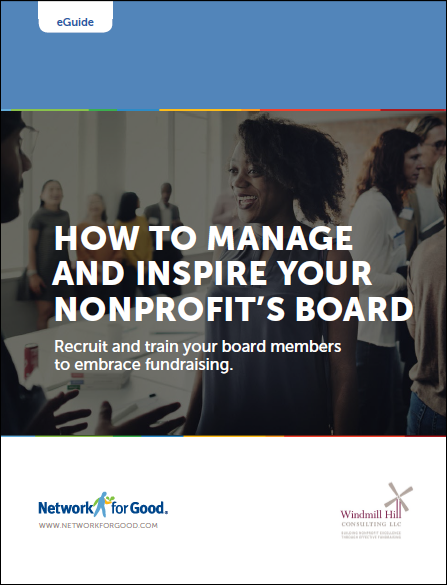 This guide also includes a sample nonprofit board member job description, a sample donor thank you call script and email message for your board members to use, and a sample board fundraising expectations worksheet.